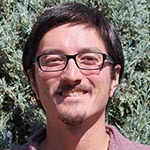 CDAC Partner Lowell Miyagi (University of Utah) has been awarded a CAREER grant from the National Science Foundation. The title of his project is “Deformation and Anisotropy Development in the Lowermost Mantle." Lowell’s five-year project involves both basic science and community outreach. Scientifically, he will continue to study the interactions between postperovskite, bridgmanite, and ferropericlase during deformation in order to understand how these phases develop texture when deformed together and to determine which phase, bridgmanite or postperovskite, is stronger in terms of texture development. Lowell and his group will also track transformation textures during the forward and reverse transformations between the two phases to work out their orientation relationships. This research program will provide information on what seismic anisotropy should look like for a subducting slab undergoing a phase transformation at the base of the mantle. The broader goal is to provide better insight into the origins of anisotropy in the D" layer and thus to better understand deformation and convection at the base of the mantle. The community outreach part of the project involves working with and mentoring local secondary school teachers. In collaboration with the College of Education, secondary school teachers will participate in a program in which they can complete an accelerated Master's degree and also do an internship in with a research group on campus during the summer. Last year, the Miyagi group hosted one of the teachers in this program, and in the coming summer, she will work with Lowell to create geophysics and minerals physics modules that will be incorporated into high school and middle school science classes (physics, chemistry, and earth science). Some potential topics for these secondary school science teaching modules include looking at the application of waves to understanding seismic structure of the earth in a physics course, and looking at the formation of ice in a diamond anvil cell in a chemistry course. Throughout the duration of the award, Lowell will continue to mentor a science teacher from a local secondary school in his laboratory, and will be further contributing to the introduction of mineral physics topics into high school and middle school science curricula.